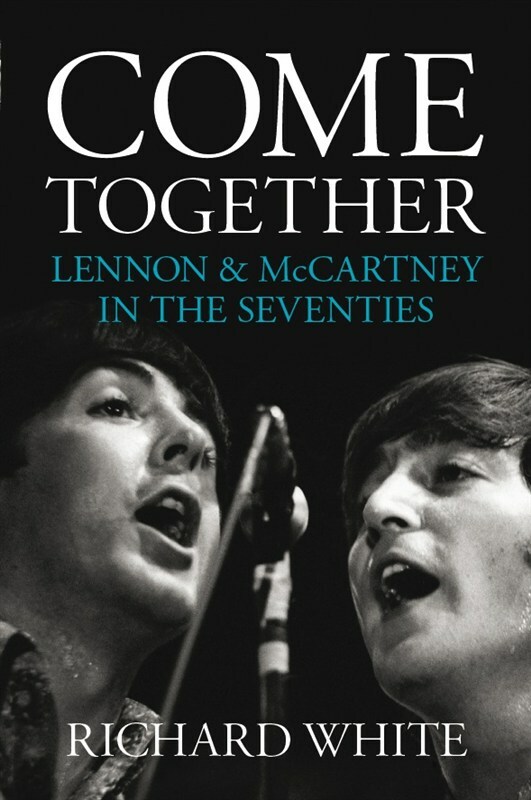 From the beginning, author Richard White makes it clear that the premise of his book is that, contrary to what the general public believed during the decade following the Beatles' split in 1970, John Lennon and Paul McCartney were indeed still friends and had definite plans to work together again...plans that sadly never ended up coming to fruition for a variety of reasons. This information has been well known for a long time, but the promise of new interviews and evidence shedding more light on these tantalizing rumors initially made the book enticing. My trepidation was heightened a bit after reading the introduction and the first couple of chapters which dealt almost exclusively with John Lennon. "Uh oh," I thought..."another book focusing almost entirely on Lennon at the expense of McCartney." For the most part, that turned out to be the case with Come Together. While there was a lot of in-depth analysis and discussion of John's life and music in the immediate aftermath of the Beatles' break-up, any mention of McCartney was tossed in almost as an afterthought, or at best in a "oh yeah, Paul did something that year, too" fashion. This is just one of the many problems I had with the book, which I'll break down into content (this paragraph) and style (the following paragraph). As far as content goes, Come Together not only didn't really offer anything new in terms of information, but it didn't even present the existing information in an effective way. Almost all of the "new" material White researched for the book seems to be from new interviews with a few members of Lennon's one-time backing band Elephant's Memory, one of the engineers from the Record Plant who worked with John, and session drummer Jim Keltner (who played on loads of John's records, but none of Paul's...more on this later). These ended up being little more than anecdotes about how cool John was, how nice he was, how excited they were to work with a real live Beatle, and how talented and hard-working he was. There wasn't much insight into his life with Yoko, May Pang, or Paul (all of which has been described in greater depth elsewhere), and was actually quite contradictory: on one hand, Keltner and the others were quoted as saying John never spoke about Paul, while on the other hand Pang (who was closer to John than anyone else during the mid-1970s) says he did. There's some discussion on their meeting in Los Angeles in 1974 when they were photographed together for the only time post-1970, and their plans (partially thwarted by Yoko) to reconvene in New Orleans in 1975 to work on music together, but other than that, for a book that is supposed to be about their relationship in the seventies, it ended up being little more than a John Lennon-in-the-1970s biography with a little bit of McCartney, too much Harrison and Starr, and not much else sprinkled in throughout. There's also entirely too much space devoted to the history of the Beatles' career and music (including a whole chapter on Sgt. Pepper!) and their break-up and the subsequent lawsuits. Again, it's been done elsewhere, done better, and doesn't fit into the narrative of this book...at least certainly not in terms of how many pages were devoted. ...and I'm not even exaggerating. This had the effect of stretching the chapters out far long than was necessary and comes across as though it was a high school student trying to hit the page limit for a term paper using this trick. Another thing I noticed that really irritated me was how certain passages were lifted from their sources out of context in order to imply something completely different from how they were originally intended. In one case, the author wanted to show how the individual Beatles all had differing musical tastes and how they combined them to create their music; he then proceeded to use a passage from Lennon's 1971 court statement where he was originally savaging and poking fun at McCartney by saying that he (Paul) had mainstream pop tastes while he (John) and George had more underground and avant garde tastes. By taking it out of its original setting and context, White set this passage up to sound more like John having a good-natured discussion on their different likes and dislikes when it was anything but! The description of the infamous bootleg "A Toot and a Snore in '74" is also poorly done. This recording of the only known time John and Paul jammed together after the Beatles is a fascinating document from a historical standpoint, but an absolutely unlistenable mess musically. However, from reading the write-up in this book, one would think that it was simply a slightly sloppy and loose but fun jam session when in reality it's little more than drugged-up studio banter and a handful of half-hearted and soon aborted stabs at some old 1950s & 60s rock classics that the assembled group of musicians can barely remember and get through. Almost all of the books referenced, mentioned, or used as source material in Come Together are books I own and have read, so apart from the new interview with Keltner and the others mentioned above, there's little new in this disjointed book. Even the two sections of photographs add little, as most consist of photos either of the two during their Beatle years, or random shots from the 1970s. There isn't even a photo from their 1974 get-together which makes absolutely no sense given that their relationship in the 1970s is the entire premise of the book in the first place! I found this omission to be overall emblematic of this book's numerous problems. For me, it failed in all of the criteria I look for in a worthwhile book: it wasn't well constructed or well written, it wasn't enjoyable to read, and I didn't learn anything new from it. While the songwriting and lives of John Lennon and Paul McCartney will continue to fascinate people for years to come, this book won't.